Congratulations to Danny Craig from Fulcrum Commercial Kitchens Ltd in Marlborough, who correctly answered that Munich hosts the annual Oktoberfest beer festival in Germany. Danny wins the £50 Cotswold Outdoor Gift Card that can be used online, in store and also on the phone via their mail order service. The Bull is a Grade II-listed coaching inn on the Market Square in Fairford, Gloucestershire, and is run by the renowned chef, Sebastian Snow, and his wife, Lana. The Bull offers a restaurant, private dining facilities, and a traditional pub bar, complete with open fires, local craft beers, spirits and great wines. 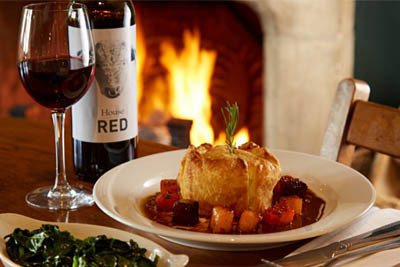 We are offering one lucky winner a £50 Meal for Two Voucher at The Bull in Fairford. "What is the name of the river that runs through Fairford in Gloucestershire?" Once you've googled this question, email your answer and contact details to jackie@jackiekerrrecruitment.com and the lucky winner will be drawn from the correct answers on Wednesday 21st February 2018 - good luck!